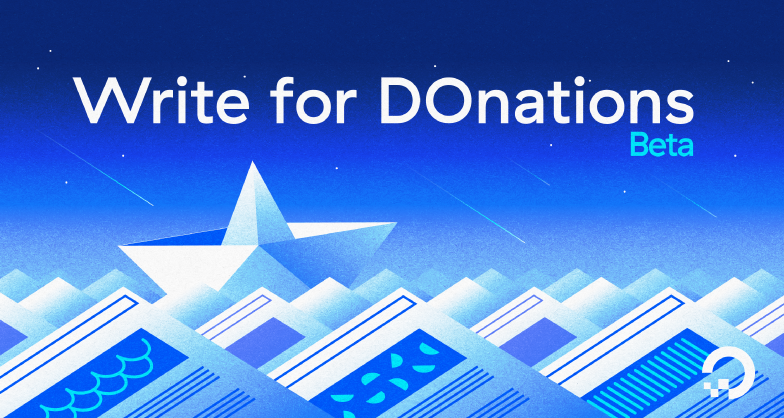 Make a Lasting Impact with "Write for DOnations"
“Our community is bigger than just us” — As DigitalOcean (DO) employees, we aim to keep this value at the front of our minds in all our work. Since the company was founded in 2012, we’ve worked hard to build a vibrant, engaging Community where everybody from beginners to professionals can learn from one another about working in the cloud. It’s important to us that the Community emulates the best that tech has to offer by serving as a welcoming place where members can share their ideas and experiences. This is what led us to introduce the Write for DigitalOcean program. Write for DO gives Community members an opportunity to build their brand, develop their writing skills, and get paid for contributing to DigitalOcean’s collection of tutorials on open-source software deployment, configuration, and development. We’re always looking for new ways to give back to the Community. To that end, we’re excited to announce some updates to the Write for DigitalOcean program and reintroduce it as “Write for DOnations” (currently in beta — the full program launch is coming later this year). DigitalOcean will match the payout to Community authors in the form of a donation to a tech-focused nonprofit, which they can choose from a predetermined list. We hope to add more organizations to this list over time, but as of the beta launch the available organizations fall into the following categories: Free and Open Source, Tech Education, Diversity and Inclusion in Tech, and organizations promoting a Free and Open Internet. The typical payout for new tutorial content from Community authors will increase to $300, to be paid either via PayPal or as DO credit. Anyone interested in becoming a DO Community author can apply by submitting a sample tutorial which showcases their ability to explain technical concepts to others. One of DigitalOcean’s editors will reach out to approved applicants and the two will work together to find a topic for an original, first-run article that would be exciting to the author and valuable to the broader DO Community. The author will write and submit their first draft, then collaborate one-on-one with their editor to revise their work to align with the DigitalOcean Style Guide. At the end of this review process, the author’s tutorial will be published on the Community website and they will receive their payout. The author will then get to choose the nonprofit(s) that will receive their matching donation. Donations will be processed through Bright Funds, and authors’ donations can either go to a single tech-focused nonprofit or be evenly split between a group of nonprofits that share similar missions. Please note that the charitable contributions made by DigitalOcean through this program are not tax-deductible to the authors. Since its launch, the Write for DigitalOcean program has allowed authors to share their diverse technical knowledge with the world while also improving their writing skills and growing their personal brand. Our team is always on the lookout for fresh content our community will love. To get a sense of which tutorial topics we’re particularly interested in, take a look at our suggested topics page. Although Write for DOnations is still in development, we’re excited to help our Community authors make a real impact by donating to fantastic organizations that are working to shape the world of tech for the better. We are actively seeking feedback to inform the full release of the the new Write for DOnations program. Check out the program’s FAQ page for more details, and please share any questions or comments about the Write for DOnations beta launch in the comments below or reach out to us directly at writefordonations@digitalocean.com.